TV dinners are one of the many childhood fascinations which lose their luster as one passes into maturity’s more discriminating embrace. 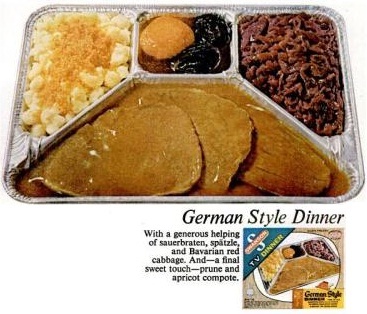 Forget Tang — these prepackaged and uber-processed slices of low-effort culinary heaven were the true apotheosis of Modernist cuisine, information pills inextricably entwined with the technological and cultural developments of post-WW2 America. They were a rare treat in our home, purchase reserved for the occasional weekend or special event such as the annual network broadcast of The Wizard of Oz. Picking the “right” meal was a process as involved and carefully considered as selecting the optimal sugar-content-to-premium ratio in one’s choice of breakfast cereal. This is what “the good life” meant to a working class tyke — an entire meal (including DESSERT) compartmentalized in a tinfoil tray placed on the living room table. By the time one has the means to realize the one’s childhood dream of eating this stuff every night, the bloom has usually fallen of the heat ‘n’ eat rose. I’m not a food snob by any stretch of the imagination, and retain an enduring fondness for the fatty, sugary depths of bottomfeeder cuisine. Chef Boyardee has been a faithful companion during my ongoing stint as a derby widow, and no five star meal could ever compare to the simple joy of a bowl of canned chili with a quarter stick of store-brand cheddar congealing on the surface. I like processed junk, though I try to temper that affection with regular lashings of fresh produce and a modest exercise regime. TV dinners (and their upscale faux “gourmet” cousins) have been taken off the table, however. Kids generally don’t have to concern themselves with things like the price or preparation of food. As you get older, you soon learn that there’s no such thing as a zipless tuck. (I’m truly, truly sorry.) Frozen meals may not be effort intensive, but they are time-intensive. The microwave revolution may have cut down the prep time to a quarter of what it was during the conventional oven’s hegemonic reign, but the rewards never match the investment…especially when anything short of total incineration (conventional) or dessication (microwave) pretty much guarantees you’ll encounter a sizeable spud-sicle swimmimg in the instant mashed potatoes. If randomly biting into a frozen medallion of Salisbury steak wasn’t off-putting enough, the subtly unpleasant aftertaste left behind by whatever preservatives were used to cryogenically embalm the meat and veg is reason enough to reconsider one’s childhood nostalgia. For all the time and expense involved, it would be just as easy to whip up a quick cheese sandwich. Not only would it taste better, there’s less likelihood it would painfully luge down one’s gastrointestinal tract fifteen minutes later. I never realized there were so many ethnic Swanson dinners. Or that they would all look so awful in retrospect. Frozen spatzel sounds particular terrible. 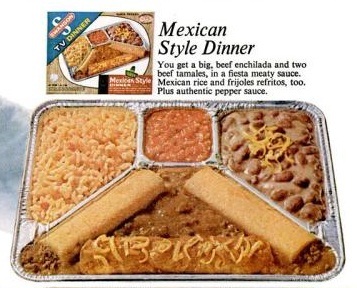 TV dinners were a rare treat in my house, too. But, I recal that I had a particular leaning towards anything with “brownie” in the little center cubicle. Also, “turkey”, “stuffing” and “mashed potatoes with gravy”. I am sure I licked a tin clean at least once. Ramen Noodles took over by teenage-hood. Today, it’s jallepeno poppers or McCain’s Smiley Fries (salsa, sour cream, cheesey dip, ketchup, gravies, hollandaise – whatever. They are like HANDLES for splurgey condiments. “Lick the plastic container.”) At least they are slightly healthier. Still, I’m a sucker for that frozen conveniece food draw! We would get these maybe once or twice a month and it was always a treat. I was particularly fond of the Fried Chicken meals, and pretty much anything that came with the “Cherry Cobbler” dessert. I haven’t had one in easily over 20 years, but I’m still pretty sure those desserts are good, although logically I know that cannot be possible. 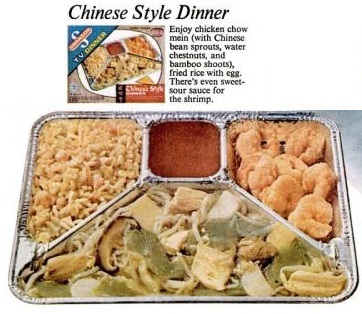 Ahhh…Swanson TV Dinners. 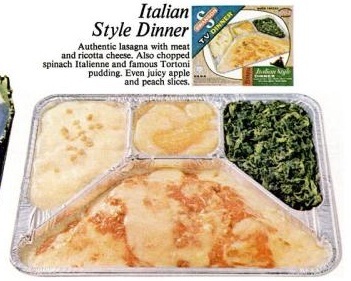 Usually we had to choke down my mother’s delicious home-cooked meals on a daily basis, but every once in a while…if my parents were going out for the evening, we received a treat in the form of a TV Dinner. They were pretty horrible…but we thought it was amazing, with all those little compartments. I was also the kind of kid who traded homebaked cookies for Twinkies. Because I was an idiot.